a) deep fried ikan biliis (dried anchovies), salted peanuts, curry chicken, hard boil egg & sambal belachan. b) cucumber, tamarind chilli prawn, hard boil egg, beef rendang & anchovies. c) you can also add your own condiment but try not to use anything with soya sauce or oyster sauce. It does not go well with the rice. 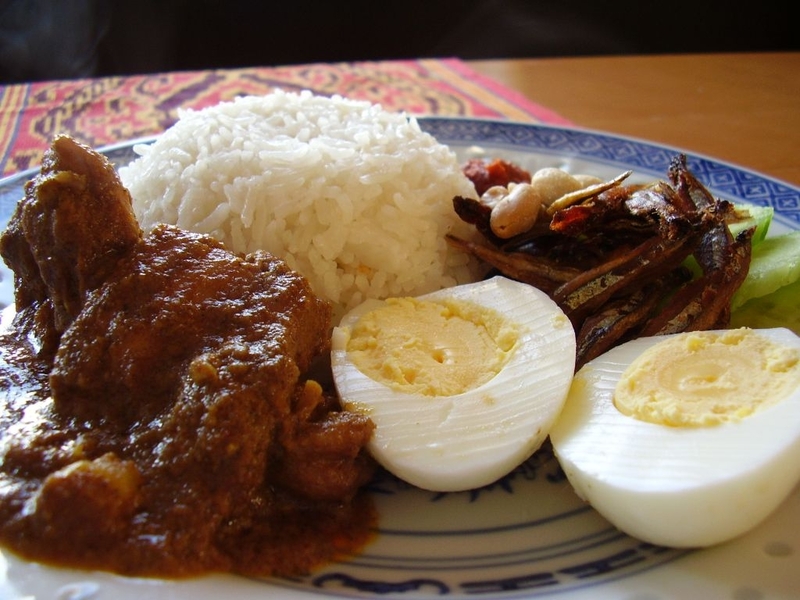 NOTE:Nasi Lemak is a favourite breakfast food and in the markets you can by small packets of Nasi Lemak wrapped in banana leaf (occasionally in newspaper, Malaysians are great at re-cycling). Very tasty and very cheap. This recipe is taken from my cookbook, ‘Blame It On Granny’. Alamak Isaac, why when I try to tumis sambal, it always taste bitter and too spicy. Is it because of the quality of dried chilly or is there a trick ? Hi Lee, you should try to tumis the sambal on low heat until the oil flows up to the surface before adding tamarind and sugar. Or maybe you tumis your sambal on high heat which might have burnt the chillies then the outcome is bitter taste. Spiciness could be maybe you didn’t remove the seeds from the dried chillies, could be a different quality. Maybe you are using the small dried chillies from Thailand which is more hotter than the Indian big dried ones. So good luck! try again.